It's the most insane road trip since "Thelma and Louise" ... 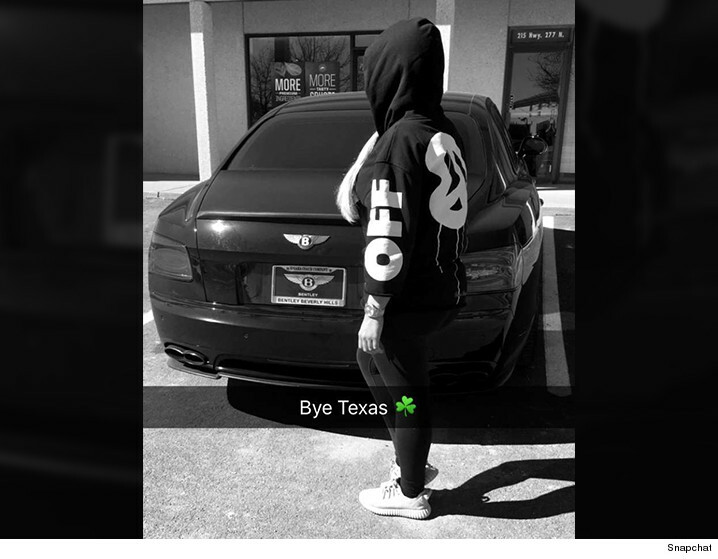 Rob Kardashian drove 1,377 miles -- from L.A. to Austin -- to personally extricate freshly freed girlfriend Blac Chyna from the Lone Star state. We didn't believe it at first, when we saw a pic Saturday of Chyna standing by a Bentley with a Bentley Beverly Hills license plate frame. The stores behind match up -- it was taken in Texas. Now our Kardashian sources confirm ... Rob drove the Bentley 26 hours to pick Chyna up. He started the journey minutes after Chyna got arrested for public intoxication at the Austin International Airport Friday at 4:20 PM Texas time -- 2:20 PT. The pic was posted at around 12:20 PM PT -- 22 hours after her arrest. The drive is 19 hours minimum ... we don't know if Rob brought a friend to trade off behind the wheel. We've confirmed it's Rob's Bentley -- the same one in which he and Blac Chyna were tooling around L.A. earlier in the week. Our sources say the Kardashian family is alarmed ... they believe the road trip is a clear sign Rob's acting irrationally, and they're worried drugs or alcohol might be involved. We're told Blac Chyna -- who posted video of her exit -- and Rob are now driving back to L.A. He's a true ride-or-die boyfriend.